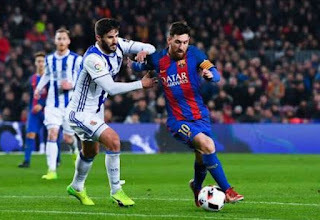 La Liga champions Barcelona finished the season on a high with a 1-0 win over Real Sociedad in what was a very exciting match at Camp Nou. Both teams had a number of good chances, and Philippe Coutinho was the man to score the winner. But the highlight of the night was Andrés Iniesta, who played for Barça one last time and had a very emotional farewell. The first 45 minutes were a lot of fun. Both teams had nothing to play for, and both teams have attacking tendencies, so both teams attacked A LOT. Neither defense was particularly bad in the first half, but they still allowed quite a lot of space and we got a good bit of chances. La Real were more dangerous early on, with Willian José and Adnan Januzaj looking very aggressive and forcing Ter Stegen into some good saves. Ousmane Dembélé was the best Barça player on the pitch and created a lot of chances on the right wing, with a beautiful cross for a Ivan Rakitic header that went just wide being the highlight. Despite the excitement we saw no goals at halftime, but surely that would change in the final period.